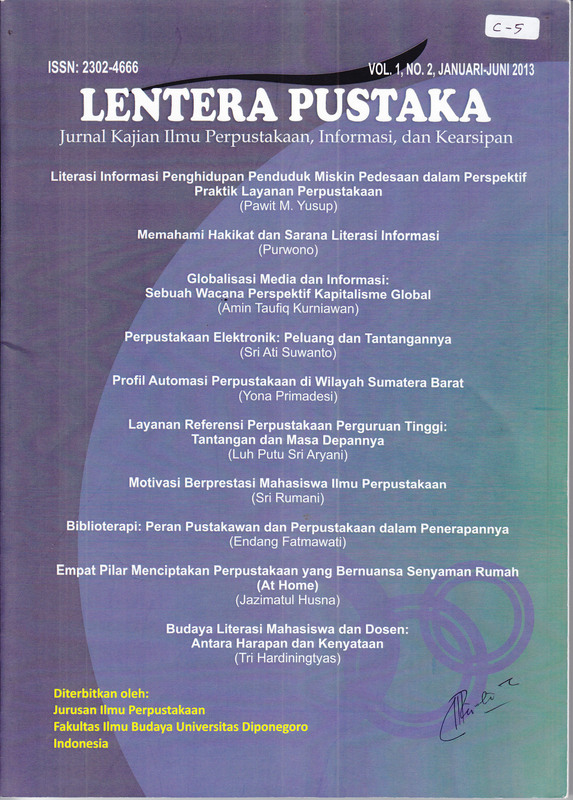 Perpustakaan Elektronik: Peluang dan Tantangannya. The Aims of this study are to find out challenges and opportunities in managing an electronic library, as well as to anticipate the challenges that will be faced by librarians. The method used is the study of literature, using descriptive analysis. The result of this study indicate that Online Library often is referred to as Electronic Library, which actually includes Hybrid Library, electronic library, opportunities and challanges for librarians and libraries. Many opportunities can be obtained by them which, if well exercised, will eventually be able to increase the institutional accreditation. Keywords: online library, electronic library, hybrid library, digital library, virtual library.